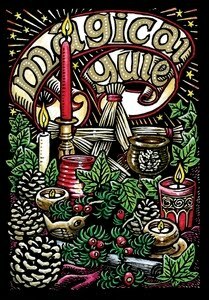 I'm a bit late choosing my Yule cards this year - normally I have bought cards before the start of December to send my witchy friends for the Winter Solstice. Then, just when I was thinking I really ought to be getting on with my Yuletide shopping, I went to a moot where someone was selling cards by Hedingham Fair, a small publishing firm that produces art cards aimed at English folklore enthusiasts. Problem solved. 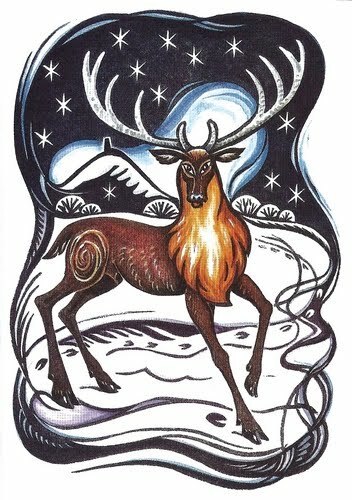 I bought a lovely selection of cards suitable for pagans and felt good that my money was going to a small family UK-based firm rather than a big greeting card company. You can see a couple of the images from the cards above right and to the left, but there are plenty of other different designs also available. The ones I bought were blank inside so I could write my own message. The online shop also sells gifts including diaries, calendars, T-shirts, jewellery, chalices and mugs.